Mom and I hate change, so when Tropicana suddenly transformed the look of their 50% less calorie orange juice, we weren't feeling it. At first, we noticed the size difference. It was much taller and thinner, a.k.a., we still pay the same, but get less in the carton. Also, they changed the name. 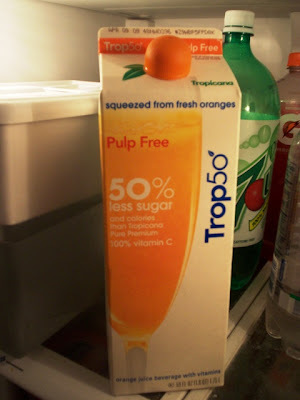 Instead of Tropicana Orange Beverage, it is now called Trop50. To me, that sounds like a rapper, or a high school kid trying to give himself a cool nickname. What we do like about the new container is the cap. It is in the shape of an orange. How ingenious! It made us want to buy the juice just so that we could take the little orange off of the container. 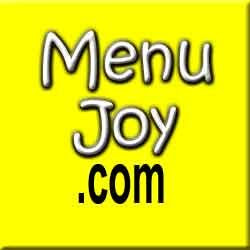 We were hoping that with all of these new changes, the taste we enjoy would remain the same. Thankfully it did. THE VERDICT: Surprisingly tasty! I was never a big fan of orange juice. It was always too - orangey. Makes sense, right? Also, I'm nauseated by the the "pulp" variety. Who wants a mouthful of orange peel? Not us, and especially not Mom. She gags. We started drinking Trop50 because we wanted to find an orange juice that wasn't loaded with sugar, and this beverage not only has half the sugar of other brands, but it also has half the calories. I have a glass with my cereal every morning, and it's all we can do to keep my father from guzzling down the entire carton before the week is over. We will definitely keep buying this drink, but we hope it doesn't get any smaller. If it does, we hope the price gets lowered. We can smell a ripoff a mile away.